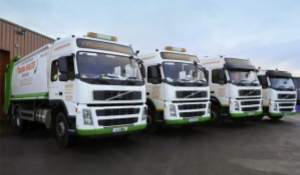 Galway-headquartered Barna Recycling, specialises in domestic and commercial waste collection, recycling, and environmental services to over 60,000 customers in the west of Ireland, employing over 320 staff in four different facilities and operating a fleet of over 130 vehicles which are maintained in its own workshops. Barna recently chose Assetminder, the award winning cloud and mobile based fleet maintenance management system to increase all round efficiencies. Manage the maintenance lifecycle of all assets, Civil Plant, Static Production, Ancillary Equipment, and transport. Ease of use; Drivers and mechanics had to be brought on board. Each driver was equipped with a smartphone with the Assetminder inspection app installed. The inspection data is immediately transmitted to the fleet managers’ dashboard where it is analysed, and if action is required to remedy a defect, it can be recorded on the Assetminder maintenance planner, and scheduled for the workshop. When the vehicle visits the workshop, an electronic jobcard will have been generated by Assetminder, with a list of the work to be carried out on the vehicle. The fitter views this via the Assetminder app on the technician’s tablet PC. A record of the work carried out and the time spent is stored on the app and when the job is complete, it automatically updates the main system so that an invoice can be generated, and the jobcard closed. The vehicle history is automatically updated as soon as the jobcard is closed. The fitters Assetminder app also allows to carry out detailed regulatory inspections on the vehicle. As data is constantly being entered into the system by the various players in the operation and maintenance of the vehicles, the Assetminder database quickly builds up a wealth of data about the companies’ assets. Making sense of this data is key to the successful operation of the fleet. Assetminders’ BI analytics reveal big-picture trends with the ability to instantly drill down to the details and understand the causes of higher-than-expected costs, with costs analysed over time, per kilometre or hour. Productivity can be also analysed by trade, staff, and task, with comparisons across dimensions such as location and time-frame. The intuitive cost analysis gives fleet managers the ability to interactively slice, dice and graph data by manipulating variables such as sub-type (clutch, tyres, etc. ), make, range, model, asset type and reason (such as accident, avoidable damage, and scheduled maintenance). With the ability to analyse costs that the system offers, Barna has been able to make significant savings on expenditure with suppliers and service providers. It has been able to dramatically streamline administrative processes. The system creates an entirely paperless solution to manage workshop administration, saving over 40 hours a month in administration alone.